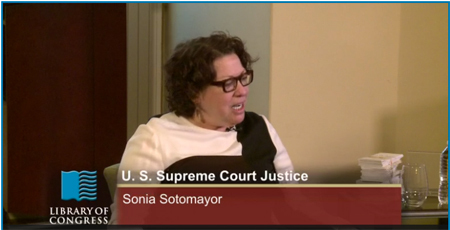 Sonia Sotomayor received a B.A. from Princeton University and a J.D. from Yale Law School where she served as an editor of the Yale Law Journal. She served as Assistant District Attorney in New York County, then litigated international commercial matters in New York City at Pavia & Harcourt. President George H.W. Bush nominated her to the U.S. District Court, Southern District of New York in 1992. President Bill Clinton then nominated Sotomayor to the U.S. Court of Appeals for the Second Circuit in 1997. Then, on May 26, 2009, President Barack Obama nominated her for appointment to the U.S. Supreme Court. She was confirmed by Congress on August 6, 2009 by a vote of 68-31. A Law Library special collection on Sonia Sotomayor includes background information on the Supreme Court justice, press coverage and links to her articles and case decisions. Also of interest is this March 2015 streaming webcast: Justice Sonia Sotomayor Explains Magna Carta to Students from School Without Walls.